Gavin Newsom is a fourth-generation San Franciscan who was elected to consecutive terms as Mayor of the city and now serves as Governor of California. Over the years, Newsom has worked tirelessly in the public sector to revitalize MUNI, restore neighborhood parks, combat homelessness and protect diversity. As Head Winemaker for PlumpJack Winery, Aaron Miller brings a wide-ranging experience and an extensive education to the position, holding a Master of Science in Viticulture and Enology from UC Davis. A California native, he found his calling in the wine industry and planted roots in Napa. Miller is dedicated to crafting Oakville Cabernet that not only showcases the terroir of the estate’s 42 acres, but also to crafting Oakville Cabernet Sauvignon in the PlumpJack style. Miller graduated from UC Davis with a Bachelor of Science in Neurobiology, Physiology, and Behavior before continuing on to receive his Masters. 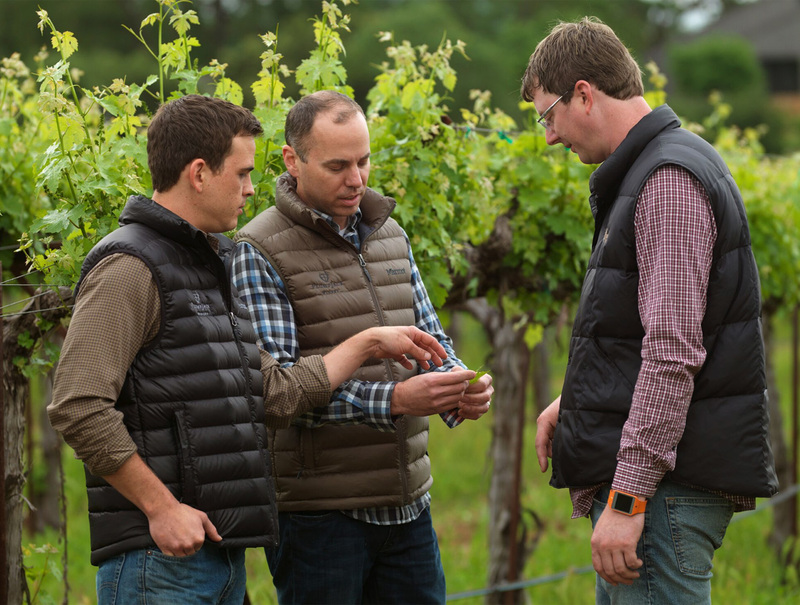 After being published in the American Journal of Enology and Viticulture and interning in Italy and New Zealand, Miller held positions at Groth Winery and Lewis Cellars. Miller, a life-long fermenter, can often be found brewing beer and making cheese when not spending his spare time with his wife and family. It was a perfect fit, "The passion and enthusiasm for the new property was contagious and I knew I had found my home," Cortney elucidated. Cortney spent 3 years at Odette Estate before being promoted to Enologist in June 2016 at PlumpJack Winery. Cortney credits her success to the team at Odette, and is eager to begin her first harvest in another cabernet sauvignon powerhouse appellation, Oakville. Cortney Zolezzi, Enologist, grew up surrounded by cherry, peach and walnut orchards in the small farming town of Linden, CA. Cortney attended Fresno State with great ambitions of becoming a pharmacist, but as a freshman she toured the winery facility at Fresno State and simply fell in love. It was the perfect combination of her two passions: agriculture and science. She went to the admissions office and changed her major the very next day. Cortney graduated in 2010 with a degree in Viticulture and Enology and immediately set her sights on a southern hemisphere harvest. She worked at a huge custom crush facility in Blenheim, New Zealand called Indevin : Custom Winemakers. While working there Cortney was able to work with several white grape varietals and expanded her knowledge of winemaking white wines in a diverse climate from her native California. Returning to the states in August of 2011, Cortney took an internship at Lynmar Estate, expanding her winemaking knowledge with the help of their winemaker Bibiana Gonzales Rave (now Pisoni). Bibiana, Cortney’s role model and mentor, taught Cortney the basics of managing a cellar and working with Pinot Noir and Chardonnay grapes, processing them from the vineyard all the way to the barrels. The next year was a repeat of the year prior – Cortney returned to both Indevin, as well as Lynmar, with each return allowing Cortney to take on a larger roll to refine her skills. After completion of harvest at Lynmar in 2012, it was time to stop bouncing from winery to winery and lay down some roots with a permanent role. Cortney wanted to cut her teeth with a small, cutting-edge winery with people who she could respect and share her passion and dedication of making spectacular wine. It didn’t take long for Cortney to find that place – in 2013 she joined the PlumpJack family at Odette Estate. Odette Estate at the time, was a brand new winery with just one harvest under our belts. Not knowing what to expect from the wines since they were still young, it only took one sip for Cortney to realize this was something remarkable. It was a perfect fit, “The passion and enthusiasm for the new property was contagious and I knew I had found my home,” Cortney elucidated. Cortney spent 3 years at Odette Estate before being promoted to Enologist in June 2016 at PlumpJack Winery. Cortney credits her success to the team at Odette, and is eager to begin her first harvest in another cabernet sauvignon powerhouse appellation, Oakville. Tia brings over 20 years of experience in the wine industry. She has held multiple positions within wholesale distributors and leading wine companies from Illinois, Arizona, to Texas. Her love of wine began in the restaurant business in Las Vegas where she took her Level 1 Sommelier Certification 22 years ago and is now a Certified Specialist of Wine. Lisa Sedgley started her career in the Napa Valley in 1999 when she moved from Arizona to California and worked as Sales Associate at Jarvis Winery. While at Jarvis she discovered a passion for wine and the consumer experience. She went on to become the Hospitality Manager at Stags’ Leap and Etude Winery, then Grgich Hills Estate. In 2011, Lisa joined the PlumpJack Winery group as the Hospitality Manager for CADE Estate Winery.